When Robert went to Florida in the summer, he not only went to Space Camp, he also met some alligators and even held one! He had a brilliant time doing this and wrote about it for a lovely Australian website called TravelThereNext. We were thrilled to find out that he was one of two runners-up in their kids’ travel writing competition and are very proud of him. “My name is Robert and I am 9. I recently went on an amazing holiday to Florida in America, and while you might expect me to tell you about theme parks, I’m not! Instead I’m going to tell you a boat trip where we saw real alligators. You don’t see those at home. My dad and I had a wonderful time on an airboat ride in Florida’s Everglades, but it wasn’t just the boat that I loved, it was what we saw too. Firstly we got into a boat that was so fast, the wind was blowing everyone’s hair backwards. Some even got into my mouth. We had to put an earpiece on so you could hear our tour guide over the wind and we could also ask questions through the ear piece. We were on the St John’s River and the scenery was beautiful, with all the plants, flowers and grass. It was such a nice day and once we got into an open space we saw cows running through the water which was really weird. I had never seen that before. Visit TravelThereNext to read more about Robert’s adventure and see some more pictures. 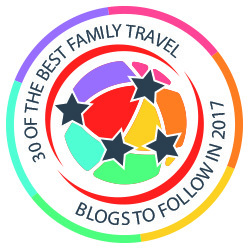 Our blog is nominated for the travel category of the UK Blog Awards. Please vote for us here – it only takes a minute and we would really appreciate it. Thanks very much. Oh wow, how amazing is that. Super memories for you all.Also on my wish list of things and places to visit. Congrats to Robert !! That is a nice article, I know some nine year old kids that barely know how to spell some of those words in the article let alone write an essay. Thank you! I love that the kids write on our blog; it makes it such a family affair! I was at the Everglades this summer, too. Definitely wasn’t brave enough to hold one of those! Haha! Way to go, Robert!! You definitely have a budding writer there 🙂 It’s great you have this kind of material posted to your blog, I have never seen it before and it’s very unique and engaging! Another super blog post, Robert. I think what I love is not just your fantastic writing, but that huge grin on your face. That tells me you were having the best time! What a gorgeous photo and a great post 🙂 Congratulations Robert.